artistically defined masterpieces of all time! In the early morn, just before the sun peaks it’s graceful face over the horizon, the waters are calm and peaceful. The boat gently rocks side to side as it rides the gentle waves upon the great ocean of life. The slight rocking of the boat brings a calm and inner peace. A peace that many seek and few shall find. It’s the calm before the storm that we all grow to enjoy. But no sooner do we enjoy this calm that a storm rides up over the horizon. In a blink of an eye, the dark clouds cast their ugly shadows in the sky that was once so bright with the sun’s warming rays. The boat, that was gently rocking before is now violently being pushed by the crashing of the waves. The big swells crash into the bow of the boat making it nearly tumble over, only to be lost forever in Davy Jones’ locker. The gentle breeze that you felt just a short time ago, has now turned into an angry wind willing to take anything and everything with in it’s path. The wind piles water into breakers. The spume from the whitecaps are cast upon the deck of the boat. You keep thinking that this storm will pass. It has to pass. For only a short while ago you were basking in the warmth of the sun as it encouraged peace upon your soul. You fight the feeling that you have felt before when you road upon such storms. The feeling is fear and like the storm, it begins to creep deep with in your soul. You try not to panic, because panic can cause you to make mistakes. Mistakes can be the difference between life or death. If you weather and survive the storm, you may regret those mistakes. So you try to keep a level head by remembering that you have survived storms like this before. However, this storm is like no other. This storm has cast it’s ugly face right at you and it’s hunting you down, ready to take your soul. The clouds are dark as night and you can not see your hands before you. You believe that you are in control as you stand with your feet slightly apart at the helm of the boat. The wind and waves crash upon the boat, casting it into an never ending battle. It’s a battle that you once felt you could win. As time goes on, you know deep in your heart, this battle will be lost and with it you will too. If only you could find the shore and walk upon it’s solid ground. In the moments when you feel you have lost, you seek the one thing that you know will save you. Out of the darkness you see a pin point of light. Your soul fills with hope as the wind and waves continue their course of destruction. But you know, all too well, of what false hope can bring. You try to keep your head clear and your soul free from this feeling of hope. In a blink of an eye, you see the pin point of light as it breaks through the darkened and stormy clouds. Could it be? It’s as if your prayers are answered when you see the light cast it’s beautiful rays over the stormy clouds. It’s a beacon you must seek and find. You turn the bow of the boat to aim directly for the light that you see. Out of the darkness you see upon a hill so high, a sight so beautiful it brings tears to your eyes. High upon solid rock stands a symbol of hope and peace. It’s a steeple beckoning the faithful to come. Tall upon the massive rock is a light house that emerges from the darken clouds, that brings hope to all whom seek it. What is it that you see? All Things New. A difference it makes. 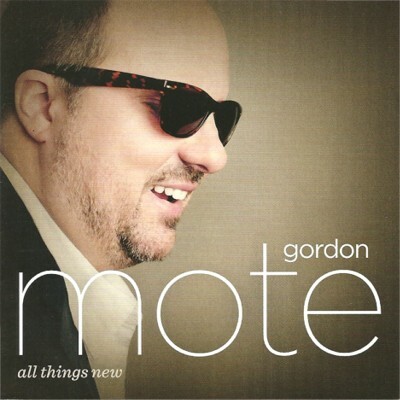 Recently Gorden Mote released his new album called All Things New. This artistically defined album features some of the most beautiful inspirational songs in music as a whole. Mote is no stranger to the music industry. Two days after graduating, with honors, from Nashville’s Belmont University; Gordon joined Lee Greenwood’s band as an accomplished musician. Since then he has performed with some of country music’s finest entertainers including Trisha Yearwood, Porter Wagoner and the Gaither Vocal Band. As a session musician, one who lends their musical talents to recordings, Gordon has played on some of country’s biggest albums. His first big break came when Mote was asked to fill in for keyboardist Pig Robbins on Alan Jackson’s 9/11 tribute “Where Were You (When The World Stopped Turning)?” Since then his talents have been on display in albums recorded by Martina McBride, Brad Paisley, Rascal Flatts and Carrie Underwood. However, his true artistic talents as a musician, singer and songwriter truly come out in his new album. This inspirational album opens with the title track “All Things New.” This song sets the stage for the overall theme of the album. The general theme for this project is giving hope while acknowledging life's struggles. “All Things New” truly captures the essence of hope with in it’s lyrics that are enhanced by an up beat melody. The album continues with “Faith Like That.” This is truly an inspiring song with it’s strong message. Performed in as light heartfelt ballad, it’s Gordon’s unique and down to earth vocals that brings this song to life. This song is the first of many, from this album, to hit our list of Top Songs of 2014 while earning a nomination for the Spirit Award’s Song of The Year award. but also there is a point in which Gordon adds a chime that enhances the song. It’s the small things like this chime that artistically defines Gordon Mote as truly a master in his craft. Another notable song on this album is “Sound A Dream Makes.” Written by Shana Canada, Gary Duffey and Mote, this is another that will hit our list of Top Songs of 2014. In this song, one can hear the pure raw emotions as Mote sings about his children. Gordon stressed that he named the song ‘Sound’ because of being visually challenged. But the song truly paints the picture of the benefits of having children and grandchildren. The song continues to inspire with lyrics that Gordon notes have touched audiences soulfully. In one part of the song, Gordon’s wife Kimberly gives the message power with her beautiful and inspirational vocals. “What we all need is love.” states Gordon. The song contains a very strong message about love. This beautiful album closes with an incredible song called “When I Rise.” Written by Boyd Hoops, this is an inspiring heartfelt ballad that will also hit our list of Top Songs of 2014. This is another song that is artistically defined. The melody is enhanced by Kris Wilkinson and The Nashville String Machine and David Davidson with various stringed instruments. But it’s Gordon’s down home, every day vocals mixed with his uncanny ability to bring pure raw emotions within his performance that brings this powerful song to life. The message in this song is about a person’s death and their rise to heaven. It is this song that I request to be played at my funeral, for it’s message of hope and peace. In the end what you will gain from this album is a collection of songs that point out various messages of hope. Like that beacon that is sought by so many sailors, listening to this album brings a sense of peace and hope to all who hear it. I can not stress enough the artistic definition that is found and heard throughout Gordon’s music. From the first song all the way to the last note, one can hear the work and skill put into it. Like a wood worker who makes his living creating masterpieces out of the wood provided by the Lord, Gordon is able to create masterpieces that over come his visual limitations. This album is nominated for the Spirit Award’s Album of The Year Award. If I could carry this album in my pocket every where I go, I would. I would hand this album and the message contained within it to all whom I meet. For there are so many people who are riding the crashing waves hoping for a beacon of light in their lives. Find the beacon of light in All Things New.